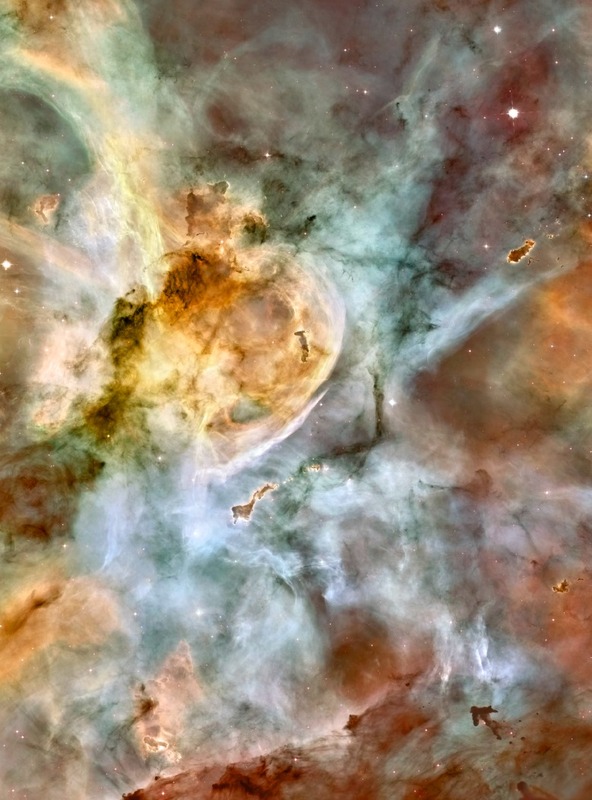 This is the Carina Nebula, also known as NGC 3372. It is a diffuse nebula and it is about 7,500 light-years from our celestial home; it can be found in the constellation Carina. This image, taken by Hubble, spans about 50 light-years. 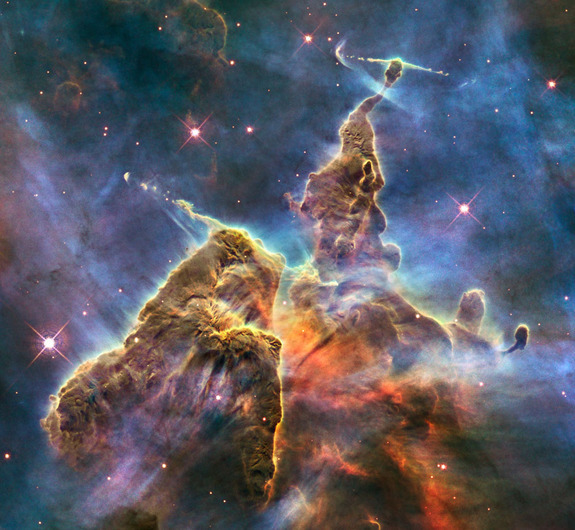 The Carina Nebula is home to several fascinating objects and it is one of largest such nebula in the sky. Even though the Carina Nebula is six or so times further away from Earth than Orion, Carina is still about four times brighter than Orion. Unfortunately, it is less known because it is found in the Southern Hemisphere. What can you see within this fantastic object? The Keyhole Nebula is the large bright ‘bulge’ of nebulous material found to the left of frame center. This structure spans about seven light-years. This portion of the nebula gets its brightness by reflecting the light of Eta Carinae. About 165 years ago, this massive star had a massive outburst causing the Keyhole Nebula to appear much brighter that it does today. On that note, Eta Carinae is found to the left of the Keyhole Nebula. It is one of the largest stars in the Milky Way and it is on the verge of going supernova. It is the bright, slightly oblong object about halfway between the left edge and frame center. During its last outburst, this massive star ejected two lobes of material which is easily seen (this feature is called the Homunculus Nebula). 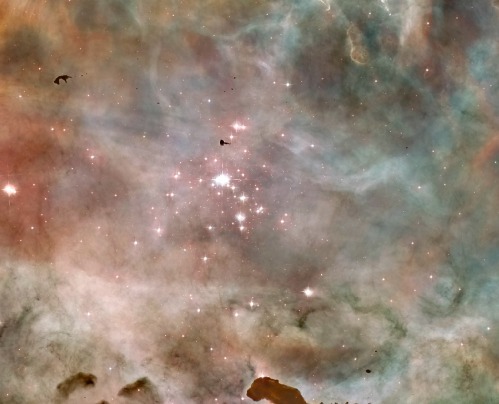 The Carina Nebula is home to several star clusters, one of the most notable is the Trumpler 14 cluster which is found about halfway between the right edge and frame center. The Trumpler 14 cluster is located near the center of a region called the ‘Bubble’. The Bubble is a hollowed out region of the nebula that was carved by the solar winds of these hot young stars. The circumference of the bubble is capped by star forming regions (or, a denser/thicker area of nebula surrounding Trumpler 14). Scattered throughout the nebula, most readily around the edge of the Bubble, are various different types of ‘pillars’ (similar to the Pillars of Creation). These pillars are star-forming regions and many of them have new stars hidden inside. On the same note, there are also several dark blobs called Bok Globules which appear to be free floating bubbles. These regions are also star forming and are primarily found within the Bubble. Needless to say, this nebula has no shortage of interesting and beautiful things to study. The below image is of majestic towers soaring out of the nebula. Hubble’s Wide Field Camera 3 observed the pillar on 1-2 February 2010.